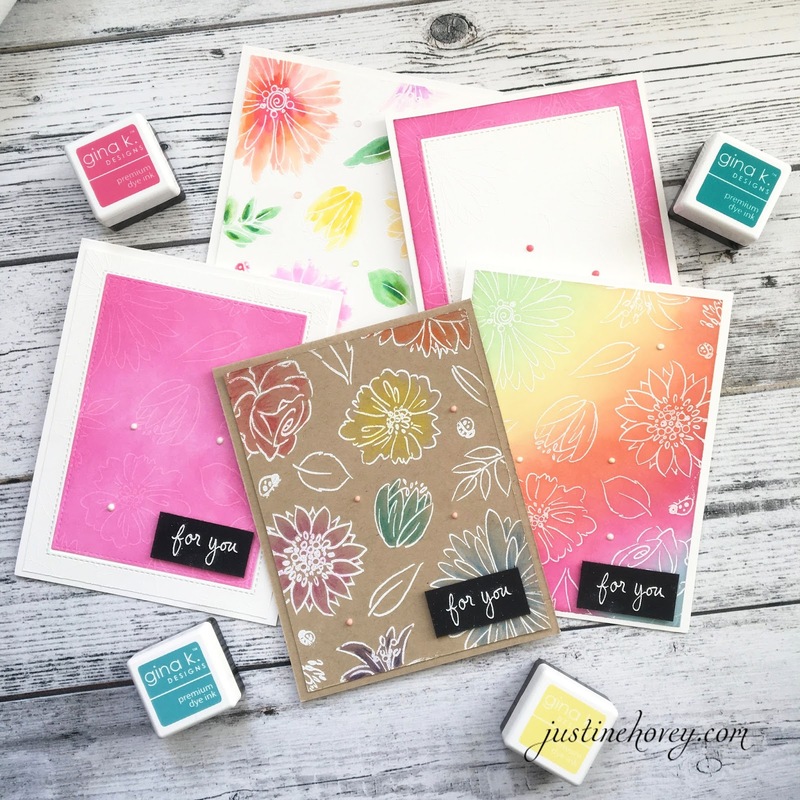 Justine's Cardmaking: 1 Stamp/5 Cards: Gina K Designs Feature! 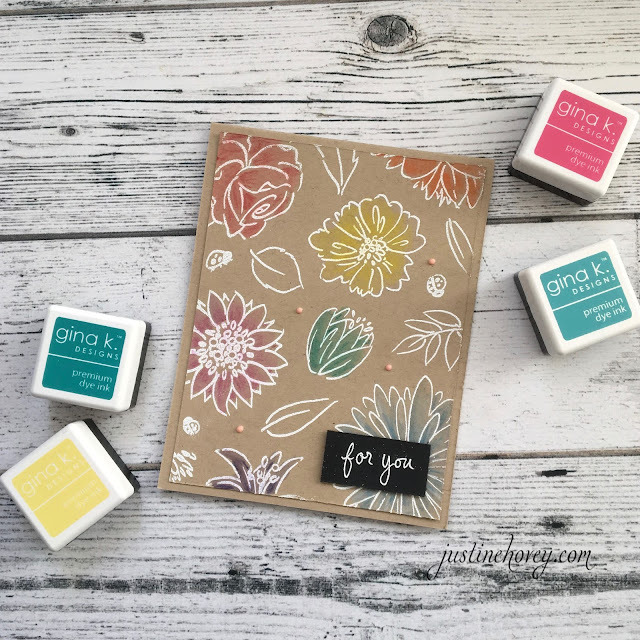 1 Stamp/5 Cards: Gina K Designs Feature! I know I generally start off with "I'm so excited about..." something but this is something more than that feeling! I am doing a feature for Gina K Designs! I am still relatively new to Gina. The first time I saw her products was at Creativation when I watched her demonstrate the Foil-Mates which I features a few weeks ago. Since then, I'm managed to get my hands on some of her fabulous inks (that get rave reviews by so many and I now understand why! ), cardstock and stamps for today's post. My goal in this video was to build up my stock of generic cards. 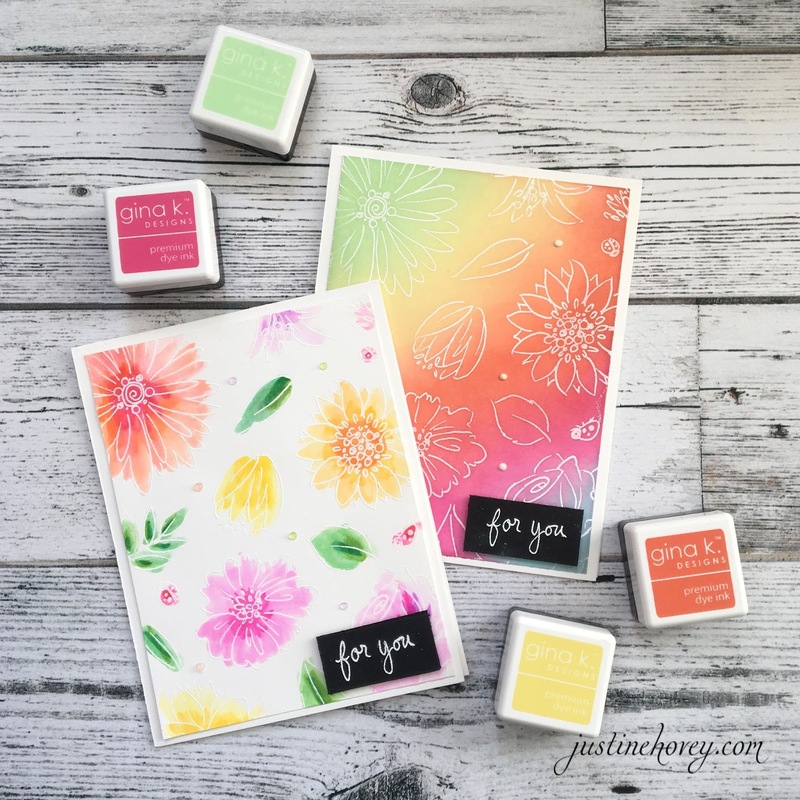 By stamping "for you" on the front, it allows me to stamp something quick on the inside like "happy birthday", "thank you" or "my condolences" in two seconds for a quick card on the go. I managed to create all 5 cards, using the same stamp A Year of Flowers 2 but each card couldn't be more different! First, I practiced blending with Gina K Inks. Let me tell you that they blend like butter on her white cardstock! Just as good (if not better!) than Distress. Super silky smooth and easy colours to match. I used Applemint, Lemon Drop, Tomato Soup, Lemon Drop and Ocean Mist for this rainbow combination. For the watercolour look, I used my Zig Markers and spread out some colour. Both cards are embossed with white fine embossing powder. I wanted to see how the background would look like on Kraft Cardstock. I love Kraft, it just brings out the colours in such a fun way. I used Derwent watercolour pencil crayons this time to get a more controlled look of my watercolour background. I also left some of the images with no colour to add interest. For this last card, I embossed one panel in white and left it alone. For the other, I stamped in Versamark and didn't use embossing powder, I just blended ink overtop for a beautiful, subtle background. I then cut out a rectangle in the middle of both panels and added them to each other to make some pretty frames. Thanks for joining me today for my first Gina K feature, I hope you enjoyed my tutorial and you will give these techniques a try! Wow! As always, your cards and technique are amazing!!! Wow! so happy to have found you through Stamptv! Love your cards! Great idea and beautiful cards! I am definitely going to try some gina k. mini ink cubes. Thanks! Great video, was so excited when you were using stamps I own. Thanks for sharing your talents and inspiring us. I love these! Thanks for sharing your awesome ideas on the video!! This is really smart, I really enjoyed the ingenuity of this craft and post.